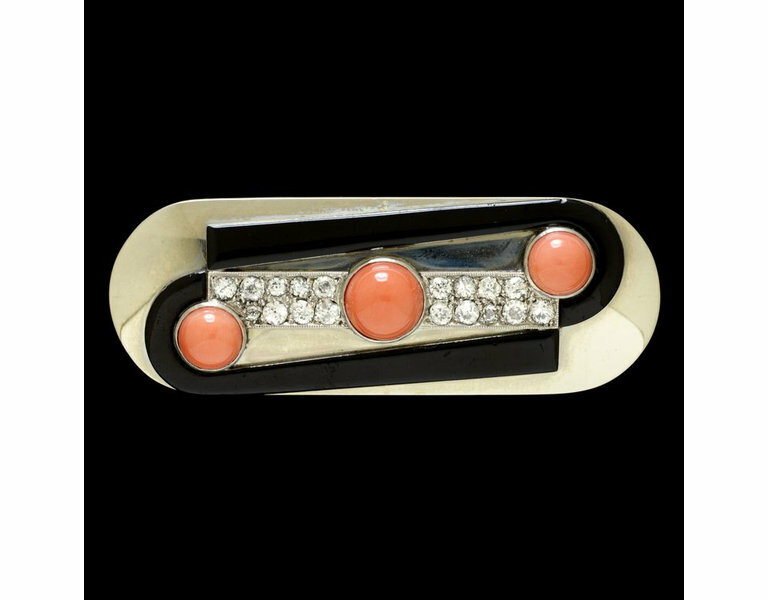 The Parisian jeweller Raymond Templier (1891-1968) was one of a small group of innovative of Art Deco designers producing work in a minimal, geometric style that looked towards Cubism and the imagery of industrial production. In 1930 he commented in the Goldsmiths' Journal 'As I walk in the streets I see ideas for jewellery everywhere, the wheels, the cars, the machinery of today'. Such sources of inspiration resulted in a new visual language in jewellery and an aesthetic where strong and simple forms replaced intricate detailing. 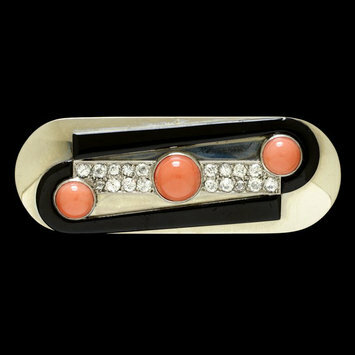 Brooch of white gold, rectangular with rounded ends, with a bar of brilliant-cut diamonds in the centre and a diagonal line of three domed discs of coral encircled by two curved sections of black enamel. Brooch of white gold, brilliant-cut diamonds, black enamel and coral, made by Raymond Templier, Paris, about 1930.